Hyperbole, disinformation, propaganda. Three words that have defined the media landscape in Ukraine for many years. However, Internews now has evidence that Ukrainian attitudes towards both domestic and Russian journalism are changing and that Generation Z, those born since the year 2000, could be powering that change. Much of modern history suggests that Ukraine has been awash with propaganda and counter-propaganda from both domestic and Russian media sources. But if you consider the fact that the quote above is from a tenth grade student in Ukraine, there is hope that change could finally be afoot and that “Generation Z” (those born after the year 2000) could be spurring it. IMF chief Christine Lagarde recently said that it is “hard to see” how the EU’s $40 billion bailout could continue in Ukraine without the country pushing through the economic restructuring and anti-corruption measures it promised back when the package was initially agreed. One of the ways Ukraine can take steps towards fighting corruption is through backing independent media and a free and fair press. However, a long and difficult road lies ahead in order to achieve this, especially when you consider the history of how the media has been perceived as a political tool, even often as a weapon, in the country. Back in 2004, Ukrainian media outlets began offering a paid service to political parties and commercial interests offering them positive coverage in print and TV for a fee. This was nicknamed “jeansa,” based on the idea of cash being slipped into a journalist’s back pocket. On top of this, in more recent years, the conflict between Russia and Ukraine has brought with it rife propaganda and counter-propaganda as a means of trying to change minds and win trust. Internews has carried out wide-ranging research which reveals that Ukrainians could finally be ready to embrace a freer and fairer press. The research shows that 36% of people in Ukraine are irritated by the prominence of “jeansa” that masquerade as independent media. This same research also shows that levels of trust in Russian television in Ukraine fell from 20% in 2014 to just 4% in 2015. For online Russian media, it dropped from 16% in 2014 to 8% last year and in print it was 8% down to 2% respectively. Trust in Russian radio also fell, from 8% to 3% within the same period. These figures suggest that there has been a marked shift in perceptions towards both domestic and Russian media sources in a relatively short space of time. 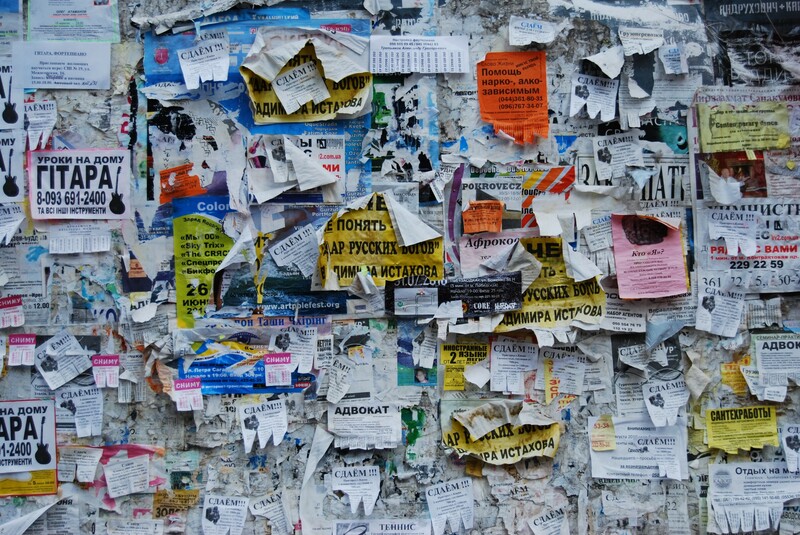 While it is clear that the overuse of propaganda and counter-propaganda has become so obvious in recent years and that distrust is eventually going to be a logical outcome, media literacy campaigns in Ukraine have also played a significant role in changing attitudes. Internews has been working in Ukraine to support independent media for 25 years. In 2003 it began delivering programs to train Ukrainian journalists on fair and balanced reporting. While this is critical work, and imperative to cementing gains made since the recent revolution, it quickly became clear that engagement with independent media is as important as its production. 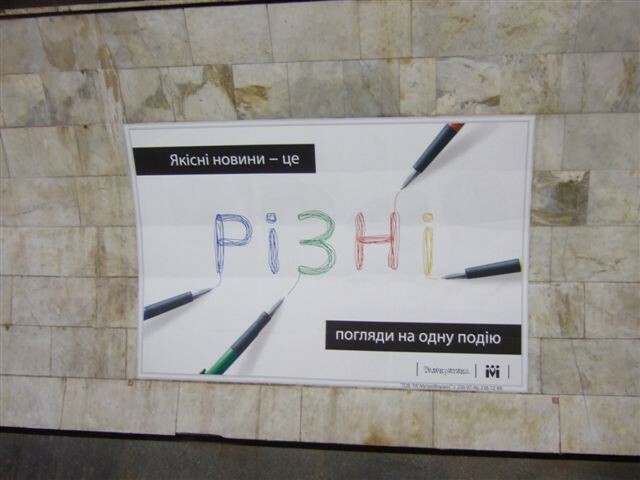 Poster on media literacy placed in Kyiv subway, 2010. Courtesy of Telekritika. Rather than taking a top down approach to the issue, Internews recognized an opportunity to educate Ukraine’s young digitally-savvy Generation Z, as research showed that targeting this demographic would make the biggest difference. Therefore in 2009 Internews rolled out a systematic media literacy program in schools and universities. The research reveals evidence that these young people are powerful in disseminating information among their peers and families. One student said he helped his parents understand the issue. “I would evaluate their media literacy training as low, but we are helping them and they are interested in what we are learning during those lessons,” he said. Internews also spoke to a student who said he had helped his brother overcome his media addiction by limiting his exposure to adverts and helping him to distinguish what is genuine news. At this critical junction, with Ukraine seeking to strengthen its democratic gains and its relationship with the West as well as fight corruption, providing people with the skills they need to engage critically with media and information is paramount. Taking a ground up approach to this could be the most effective way forward. Generation Z are digital natives able to disseminate information to their families, peers and siblings effectively. As we have seen, some have even been acting as mentors to their family members who beforehand did not know about the existence of disinformation in the media. Without perhaps even realizing it, Ukraine’s Generation Z could be creating a demand for change and therefore carving a path towards a more democratic society where balanced reporting and access to unbiased information eventually becomes the norm. Daniel Bruce is Internews Chief Executive in Europe. Internews’ work in Ukraine is supported by USAID, Global Affairs Canada, and The Embassy of Sweden in Ukraine. CEO, Europe @Internews. Tweets in personal capacity. Mostly: #globaldev #mediadev #commisaid #pressfreedom. Retweets are not endorsements.